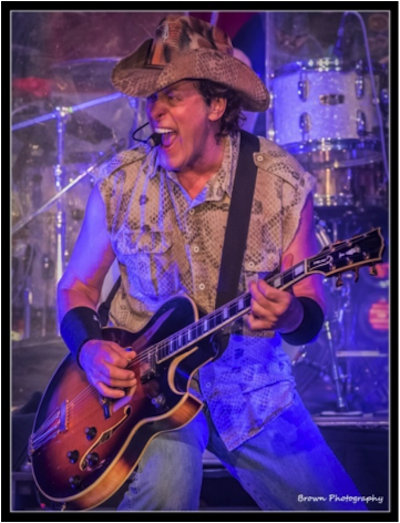 Ted Nugent has announced 13 new U.S. shows, which are set to take place between the middle of July and end of August. It will once again feature Greg Smith (Alice Cooper, Ritchie Blackmore’s Rainbow) on bass, Jason Hartless (Joe Lynn Turner, Mitch Ryder) on drums, and the Motor City Madman himself on lead guitar and vocals. Ted Nugent’s latest release, The Music Made Me Do It, came out on November 9th on Round Hill Records. Watch the video for the title track, here. Ted Nugent was my first guitar hero. When I was in my early teens, I went trout fishing at Mammoth Lakes with my Dad (the best fisherman I’ll ever know). One of the fishing marina operators told us that Ted Nugent was fishing in Mammoth Lakes the week prior, and music fans were approaching Nugent to talk to him about music. But all Nugent wanted to talk about with these fans was fishing, not music. I was bummed we didn’t plan our fishing trip a week earlier to coincide with Nugent’s fishing trip so that I may have had a chance to meet him. Cool story, bro! Hey, did you watch American Pickers last night? Brother Doug! I didn’t have a chance to watch it! Funny, as I’m tying this post, Wango Tango is playing in the background…..
It’s On Demand, hopefully you get a chance to check it out. It was cool hearing Whitford share so many stories about Aerosmith’s early days in their original touring van with his son and all of us! I hope I get a chance to see it up close at their residency in Vegas next month! 😉 Are going to see Uncle Ted in July? I’ve seen Ted a few times, but not since he toured with KI$$. No, won’t be able to see him in July, we’ll be just returning from an almost 3 week vacation on Maui. I saw Ted a few years back and was not impressed. It was a rush through the greatest hits and leave the stage early night. I am a huge fan of his music. He has so many deeper great cuts to make the shows more interesting that he should play. The whole State of Shock album is great!. In more interesting news there is this band that I am really loving right now called Lucifer. Doomy, Sabbathy sound with a woman singer.They released their 2nd cd that year. I’ve seen Uncle Ted three times. Twice as the headliner and once opening for KISS. Always great. I would rather put crunchy peanut butter in my underwear… and have someone give me a wedgie.